Is Kim Jong Un more dangerous than his father? North Korea's threat to launch a preemptive nuclear strike against the United States has puzzled American officials, who see the regime ramping up its threats and rhetoric. It's leading to the belief that North Korean leader Kim Jong Un is more unpredictable, more dangerous and harder to read than his late father, Kim Jong Il. "The new leader is acting in ways a bit more extreme than his father, who was colder and more calculated," a senior administration official said. "Kim Jong Il was more aware of the off-ramps to end these escalations. "I don't recall he ever went this far in terms of the pace and scope of the rhetoric. Threatening to launch nukes directly against the United States and South Korea confirms what a lot of people have been saying, which is we are dealing with someone new," the official added. 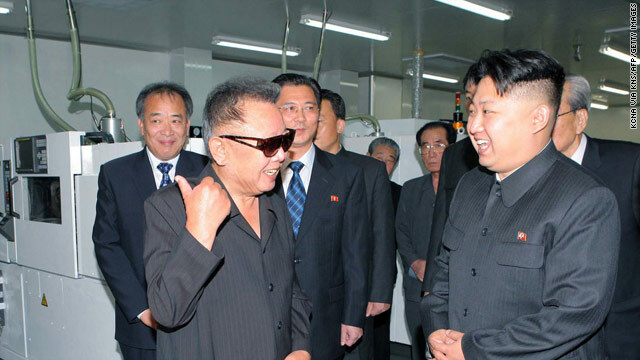 Comparing Kim Jong Il, who died last December, to a chess player, the official said the son is more like a boxer. "Nobody knows what he has planned, what he is thinking or contemplating doing or why the North Koreans are tripling down on their rhetoric," the official said. Another senior administration official said Kim's youth and education abroad offered promise for many North Korea watchers that he would be more willing to engage with the West. "Unfortunately, he is following the example of his father and grandfather pretty closely," the official said. "It's hard to be optimistic." His grandfather, Kim Il Sung, was the founding leader of North Korea. Officials said the latest threats, coupled with North Korea's nuclear test last month and its launch of a long-range rocket into space in December, have the United States and South Korea bracing for the possibility of a violent response by Pyongyang to tougher U.N. sanctions approved on Thursday. They pointed to the 2010 sinking of a South Korean submarine and shelling of a South Korean island. "It's dangerous to dismiss these threats as just rhetoric and propaganda, the second official said. "It's hard to predict." Leading up to the U.N. vote, North Korea upped its bellicose rhetoric. A spokesman for the foreign ministry suggested the United States "is set to light a fuse for a nuclear war." As a result, North Korea "will exercise the right to a preemptive nuclear attack to destroy the strongholds of the aggressors and to defend the supreme interests of the country," the country said in a statement carried by the state-run Korean Central News Agency. Despite the strong language, analysts say North Korea is years away from having the technology necessary to mount a nuclear warhead on a missile and aim it accurately at a target. And, analysts say, North Korea is unlikely to seek a direct military conflict with the United States. North Korea's behavior is even more curious because it comes as South Korea's new president, Park Geun-hye, took office last week calling for new dialogue with the North. Although she pledged a strong defense posture and retaliation against North Korean provocations, she called for easing tensions that grew under her predecessor. "Given that for five years they were so angry at the previous president, Lee Myung-bak, why would they mortgage the next five years by being so difficult when a new South Korea leader is just taking office," the first official asked. "It's so very concerning." Officials note that China, North Korea's closest ally, has demonstrated unprecedented frustration with Pyongyang's behavior. In rare public statements, a top Chinese Communist party official suggested that China abandon North Korea and support unification with South Korea. "We are in a new territory. Something is happening in China," one of the officials said. "For the North to be acting this way at this time has everyone on edge on what is going on, but nobody has good answers because the country is so opaque. We are trying to find a precedence to explain this." The worst possible explanation, the official said, "is that the North Koreans don't have a plan. That is when chances for miscalculation are the greatest." Everything is very open with a precise explanation of the challenges. It was really informative. Your website is extremely helpful. Thank you for sharing! of course he's dangerous. he was handpicked by his father, so he probably spent his entire childhood being taught that north korea was an unbeatable nation, that he himself was it's perfect leader, that america was hell in disguise, etc. someone like that is not only terribly unpredictable, but also extremely dangerous. When has the north ever attempted to ease tensions? Don't Trust Obama To Protect Our Allies And Interests Abroad You Most Certainly Will Regret It. How about we agree that you have no clue what you're talking about – perhaps citing an example you didn't see off on fox news would be a start.....The President is protecting our interests and allies- too bad you never get to see it. He needs a reality check like maybe a drone carrying a bomb with his name on it . Do you people have any life, who cares which dictator is worse? the ? is USA do you. Kim is just a figurehead .. in fact it is his handlers who – while they remain in the background, are controlling policy; and this latest 'military threat' is an attempt by them to extract major concessions from the USA and to a lesser extent, to get more aid from China. It has become evident that you have no concern for the well-being of you citisens. You do not value the lives of NK soldiers any more than you value the lives of SK or U.S soldiers. It seems that provoking a war is just a simple game to you. It does not matter to you if the end result is a loss of lives of thousands or even millions and you do not care for those left behind to mourn their lost loved ones. There is no point in pleading you to think about others, when the only thing that you value is your self. I don't know how you have imagined how the war between NK and U.S would go, but I'm certain that you honestly believe that you can survive such a war. Sir, you could not be more wrong. You need to realise that if you start this war it doesn't matter how many U.S soldiers, SK soldiers or SK civilians die, wether the number is zero or two million. From day one to the last day of fighting, you will be the number one target. You will be hunted down, but not for capture, not to be trialed nor jailed. You are going down the same path as Usama Bin Laden, and to the same place the path ends. Come on now.... The best thing for the new NK leader is a US invasion. He is very aware his country can't continue in its present direction. Once the people realize how much they have been oppressed he will be enemy number 1 i his on country – and perhaps healready is... He can't open up his country without undermining his own personal security. If he tries to change the country to fast his own brainwashed army will turn on him. His safest bet is to provoke a US invasion which wipes out most of his army. He can then get politicol asylum in another country and be safe. NK will be able to unite with SK and follow the path of East Germany. Dangerous is not a synonym for stupid. And when he does strike we'll be ready. along with the rest of the world. Great, thanks for speaking like you're in charge of things, you id*ot. 1. somebody, especially a king or queen, who rules a state or territory, usually for life and by hereditary right. 2. somebody who possesses exceptional power or influence in an area of activity. Kim Jong Un may not think he's a "monarch in the traditional sense, but that's exactly what he is; someone who rules a state or territory with absolute authority, and the position is obtained by hereditary right. Most other Communist countries (at least in Europe) all had Politburos that could remove the nation's leader if he went off the rails (as with Kruschev, Honnecker, etc). North Korea doesn’t even have that. North Korea is nothing more than a monarchy where the peasants starve and the royalty and aristocracy eat well (evidenced by photographs of the lad). This family is more “imperialist” than America ever thought of being. Actually you are quite wrong. Most of the power lies with the ruling political party and military. Kim is just a figurehead, an icon. "The worst possible explanation, the official said, "is that the North Koreans don't have a plan. That is when chances for miscalculation are the greatest." – I am surprised the officials are so perplexed. What the North Korean leadership is doing is a familiar game of raising the stakes, hoping the rest of the world is relieved when they settle for less than the worst case scenario. It is a familiar game. This kid might have access to grownup toys. I only hope those who own him are more mature and have a better barber. Maybe he wants to show that he can do better than his father by bringing the unification of Koreas under Communist rule. Is anything wrong with that ? from their and Communists perspective....Given the Rampage, Stealing and the Sufferings of the downtrodden in Capitalists Countries ? In Their minds they are Trying to Help others to a better Life....ruled by the Working class...where NO Greed takes hold......Greed and Corruption are big problems for most countries and Commune-ism is just another Ideology to attempt to solve those problems. Whether it does or not, I do Not know ! If you were actually a professor of history and religion you *would* know the answer when it came to whether or not communism was the answer to a renewed peace and sustainable structure. It's not. It hasn't worked yet because Communism assumes total transparency of the people responsible for keeping the communist structure in place and so far no country has been able to wrangle up politicians who could be trusted not to abuse the communist structure in their favor. The best example? NORTH KOREA. Their citizens live in abject poverty as the governing body and military live large at their expense. You want proof communism is not the answer for Korea? Look at North Korea's barely surviving state and then look at South Korea's thriving capitalist state. South Korea is an utter paradise when compared to North Korea (when compared to a great number of places, actually – it's a very clean and beautiful country). That you couldn't figure this much out makes me think you're not a professor of anything, just a NK puppet hired to spout pro-NK rhetoric online. Which is funny in its own right if anyone thinks NK's propaganda machine works anywhere outside the very insular NK government and military. We need to drone them gangam style. How long do we haft to wait for north korea to actually send a missile.then the so called anylist well say well they coulndt make it all the way to heart of America. Stirke now and save thousands. I was told kill the few to save the many.not wait and see many they can kill first. Or we can wait in a year when they do have the capabilities to do so. Obama will wait till next president to make a decision so he does not haft govern. Instead hill go campaigning some more or golf neglect or military,shut down white house release more prisoners and blame on republicans!! And get north Korea in press conference with kim and generals behind him. look i reit this 2 times ant gona right it agen,.pnm,. theres moe to Kim J an NK.hes not looking 4 war or that commy hood he,s with in yet the vote is not hes moves he,s looking 4 better in gov,s as he has cometted any crims up to mow of any tipe an thats not ezy a crime to me is a injustus put 4 by1,.pnm,. Right, but can someone clarify 'it'? The headline asks, if he is more dangerous than his father. Suffice it to say, the ones pulling his strings appear to be just as dangerous. China should annex North Korea instead of giving it to South; if Korea is reunified by South, they will be a greater threat to regional security, and South Korea will have all their long range missile and nuclear technology! They are all Koreans, and Koreans are crazy! Also, I don't think South Korea's can feed 24 million starving people and develope a country that is larger than itself. It will be a disaster to South Korea's economy. A couple of well placed cruise missiles into their nuke facility will quickly shut this little four-footer up. The problem, most of the non-intellectuals here fail to comprehend, is that allot of people will die prior to the goal of ilimination of this rogue regime. I wonder how many of them have a number in their mind that would be acceptable ? All of them would be acceptable. Think of what a great vacation spot NK could be if we just got rid of the NK's. Why should I care how many die? I wouldn't affect me at all. You can try to use the economic card I guess, however war is a money maker and I would come out on top. I agree, someone shouls neuter him. Maybe it will be the Chinese? That would be a statement. NK set the precident by attacking SK Territory, Killing SK Soldiers, and sinking SK boats. Kim Jong Un appears more dangerous, irrational, and certainly carries more weight than his Father. "carries more weight than his Father" - I see what you did there.